Time Living There are 28 products. The Alderley is a stunning and stylish metal bed frame that would add grace to any bedroom. The Braunston is an elegant and sophisticated bed frame for the style-centric bedroom. The deep padded headboard with clean stitching detail and the modish chrome corner feet create a brilliant impression of design and style. The neutral colours and cosmopolitan design ensure the Braunston will confidently settle into any bedroom. 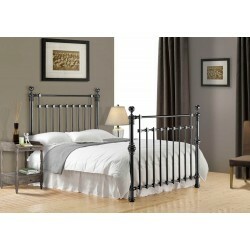 The Brennington is a stunning and mordern metal bed frame that would add grace to any bedroom. The Brooklyn is a beautiful fabric frame available in grey or blue. 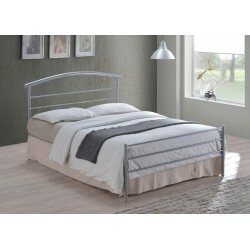 The frame features chrome feet which makes this bed perfect for any modern bedroom. 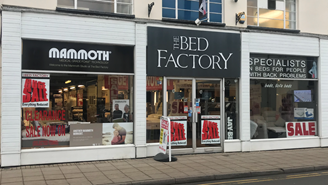 The sprung slatted base offers an adaptable and supportive sleeping surface, it can also make your mattress feel softer to lie on. The City block is a elegant and modern metal bed frame that would enhance any bedroom. The Edburgh bed frame is a blend of style and simplicity in design. Upholstered in a luxurious soft fabric the Edburgh provides an understated elegance to a style conscious bedroom. 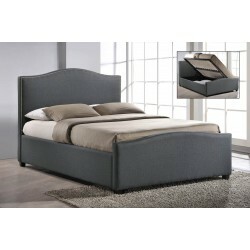 Its sleek headboard with side wings tapered from top to bottom. Paired with a neatly rounded foot board brings a timeless appeal to this classy piece. 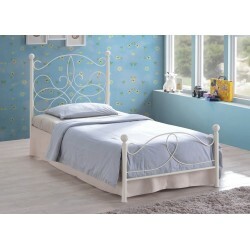 The Florida is a beautiful metal bed frame in a Victorian style design. The fine details in the head and foot end would make this a truly eye-catching piece in any bedroom. The frame is complete with a sprung slatted base that provides a comfortable and supportive sleeping surface. The Geneva is a fabric bed frame that has a very clean and simple design. Nothing too extravagant, this frame just works! Available in 2 colours, this frame would look perfect in any modern bedroom. The sprung slatted base provides support and comfort throughout the night. The Hamilton is a stunning fabric bed frame that features a beautiful buttoned headboard. This eye-catching bed frame would be the ideal centrepiece to any bedroom. Finished with a sprung slatted base for support and comfort, it may make your mattress feel a little softer. 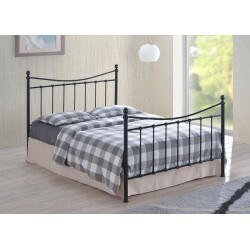 The Inova is a lovely traditional metal bed frame that would bring grace to any bedroom. The Mayfair is a beautiful looking fabric bed frame with wooden legs. The wooden frame makes for a sturdy, durable bed frame that will last the years. The frame is available in either dark or light grey, making it a perfect choice for any bedroom. The sprung slatted base offers fantastic levels of support and comfort. The Melissa is a stunning contemporay metal bed frame that would be a benefit to any bedroom. The Meridan is a unique looking metal frame available in a wide range of sizes. The solid metal construction means this frame will last and last. The sturdy frame is complemented by very stylish foot and headboards, making this frame a real eye catcher. This frame is finished with a sprung slatted base. The Miami is a metal bed frame based on a classic Victorian design. This beautiful looking frame would be perfect in any bedroom. Constructed using metal, this frame is guaranteed to last the years. The sprung slatted base helps keep you comfortable and supported. The Novara is the perfect combination of class and elegance. 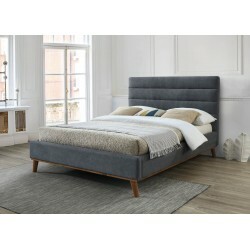 This stunning soft fabric frame features a beautifully curved headboard and striking wooden legs. Available in Light or Dark grey, this bed frame would fit into any bedroom! Finished with sprung slats, this bed frame provides fantastic level of support and comfort.